The history of the third monastery of Euthemius, which bears his name, illustrates the history of Christian monasticism in the Judean desert. Young monks were drawn to the holy Euthemius and the monastery became the most important and central among the Byzantine monasteries in the 5th century CE. 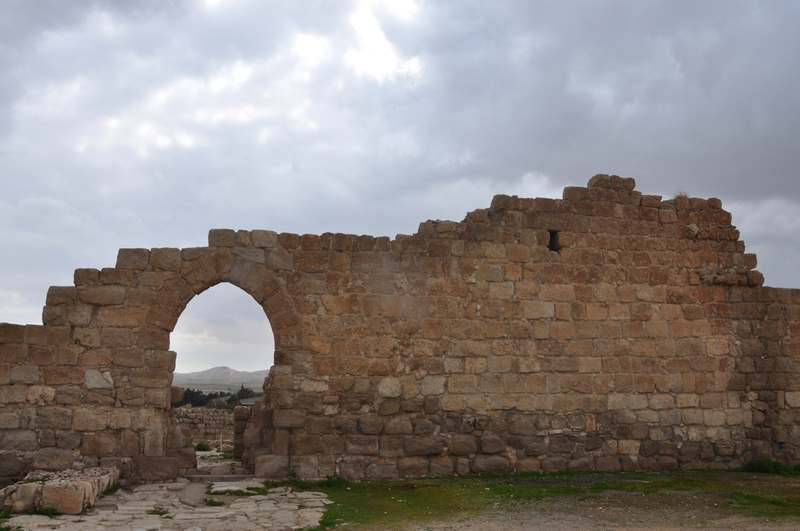 Euthemius came to the Holy Land as a pilgrim in 406 from Armenia and stayed at the laura of Faran, founded by the monk Chariton at Wadi Qelt. A laura is a cluster of caves or cells where monks live in seclusion and meditation. They gathered centrally once a week, generally on Sunday, for prayer. After five years, he and a fellow hermit, Theoktistus, moved to a cave on the cliffs of Nahal Og. With additional monks attracted to Euthemius, the site became the first coenobium in the Judean desert. A coenobium is a communal monastery where the monks live together with a strict daily schedule of work and prayer, a walled complex that consists of living quarters, refectory and church. To continue in solitude, Euthemius and a fellow hermit, left the monastery and moved to the ruins of Masada. In 428 CE he returned to the monastery of Theoktistus but preferring solitude went to live in a cave to the west of the monastery off the main Jericho-Jerusalem road. When other monks joined him, it grew into a laura. In 475, after a full life, Euthemius died at the age of 97. After his death, the laura became a coenobium and a crypt was built in the center of the monastery around the same cave where the monastery had begun and his bones re-interred there. Pilgrims came to visit the monastery to pay their respects to Euthemius and a tradition arose to pour wine down a chute to the crypt which poured over his bones – the wine was collected as a keepsake. By the end of the fifth century many important monasteries were established, including Mar Saba, Martyrius, Gerasimus and St. George – all of which can be visited on a tour of monasteries in the northern Judean desert, also called the desert of Jerusalem because of its proximity to Jerusalem and Bethlehem. Unlike most Christian sites, the monastery was not damaged by the Islamic conquest of 638. 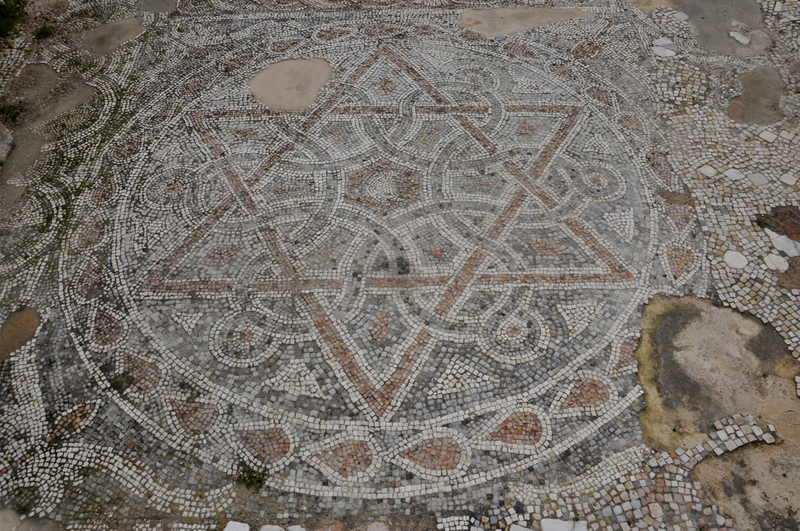 However, it was severely damaged in the 659 earthquake – the ruins of the church that we see today are from after the earthquake, the mosaic floor is from the Byzantine period. The monasteries in the Judean desert were frequently attacked during the Islamic period and in 809 the monastery was plundered and destroyed in the 12th century. 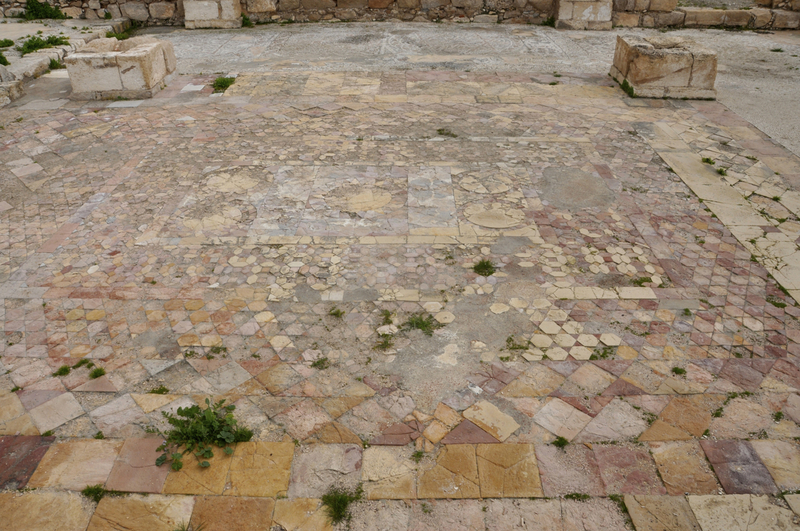 The main arched gate on the northern wall and the eastern wall and the opus sectile floor in the church are from the Crusader period. The other important aspect of the Judean desert monasteries are their water systems, for little rainfall falls in the region and water had to be accumulated or it would be impossible to live there. 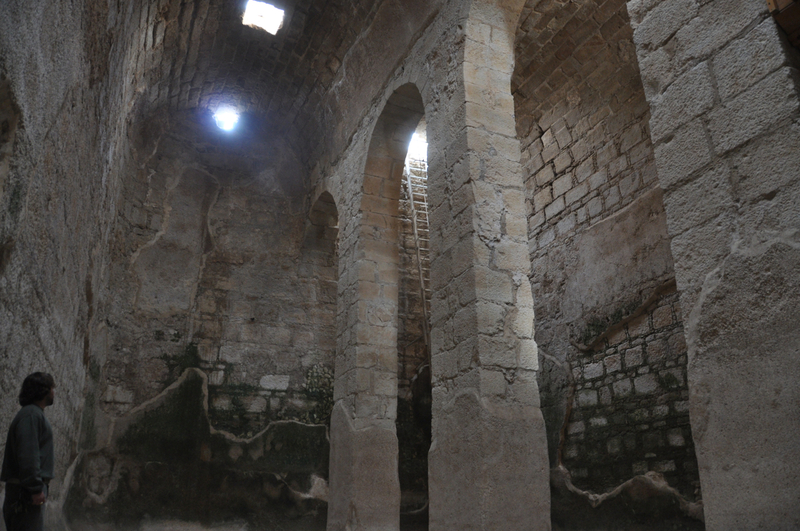 Four tremendous cisterns were discovered in the monastery. You can enter the largest one (12 meters by 18 meters and 12 meters deep that would hold 3000 cubic meters) which is outside the eastern wall. Channels bring water from runoff to a collecting pool and then to the covered cistern. 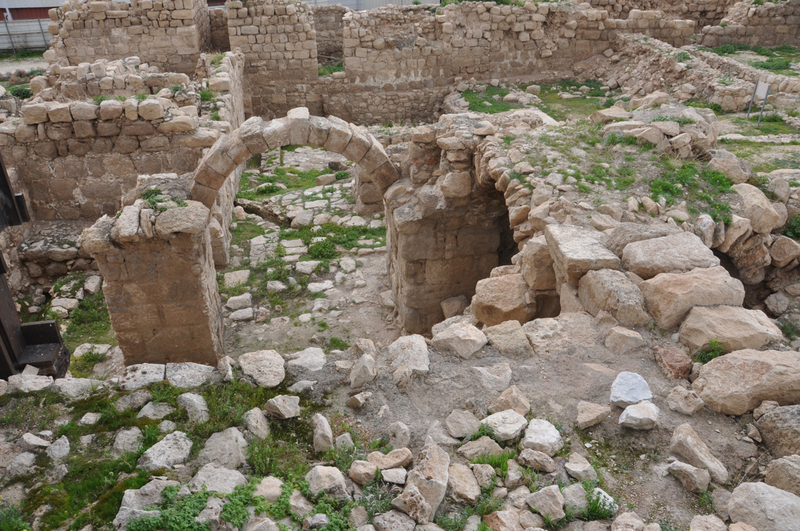 This entry was posted in Archaeology, Church, Jerusalem, Mosaics, Pilgrimage, Tomb and tagged christian monasticism, Judean desert, mar saba, monastery, Wadi Qelt on February 21, 2013 by Shmuel Browns. What a great mosaic. Thanks for the great pictures and details.